By Rebecca Nickols on January 11, 2013 Visit Rebecca's Website. What a wonderful surprise I’ve discovered! Less than a mile from my property are several bald eagles overwintering. I can’t imagine that this is their first winter here, but then again I don’t know how I’ve missed them for the past ten years… With the trees now bear of leaves, their large shape and distinguishing white head make them easy to spot. The bald eagle has quite the regal presence in the landscape… Not only is this majestic bird the national emblem of the United States, they are considered near the top of the food chain in the bird world. Bald eagles don’t receive too many threats and they’ll readily steal the prey another bird has hunted and captured. Their diet consists mostly of fish, but these birds can (and will) eat a wide variety of foods depending on what’s available (birds, reptiles, amphibians, carcasses). Their preferred habitat is near large bodies of water, staying away from heavily developed areas. The eagles near my property are usually seen perched on the trees overlooking a spring-fed pond or the near-by James River. Though I have seen them flying over my property, I haven’t noticed them hanging around the 3 acre pond in my backyard (perhaps because it’s surround by houses, dogs and trees). Next I called upon the Community Chickens facebook followers to share their experiences and thoughts on this subject. Here are the questions I asked and a few of the over 60 comments I received! A question for the Community! 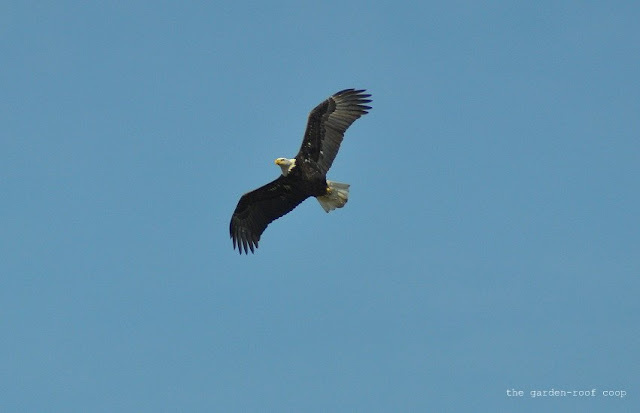 I have several bald eagles overwintering near my property. My flock free-ranges during the day and I know that an eagle is capable of making a meal out of one of my hens, but my questions are: Have any of you ever witnessed a bald eagle attacking a chicken? What measures do you take to protect your flock from overhead predators? Tina Baldonado We have Eagles and many hawks here, but i have not ever heard anyone losing one of their flock to one. Peggy Thompson I have eagles of all ages that are here all year long. I have lots of bushes in my free range area and a few make shift shelters for them to hide when the eagles are circling. They seem to go for the chicks rather than the hens. My rooster has challenged them once that I watched. Adrianna Lowe I have never seen one go after a live chicken. Here in Arkansas there are tons of chicken houses (home of Tyson is in Ar) the eagles hang out around them to pick up and eat the ones the workers put out. Mary Neill Schuytema I have had a hawk come and take off with one of my hens. I was watching out the window, ran out, and was able to get wing tip because the hawk was struggling with the chicken. The hen had a nasty cut under her wing, but did heal up. 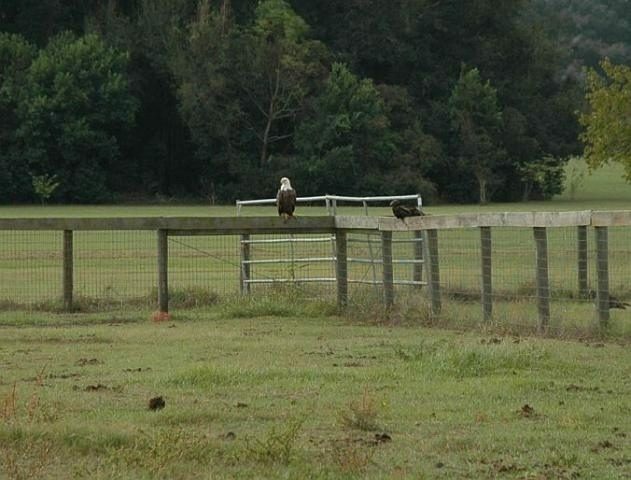 I do have eagles on the property also, but none have attacked that I know of! Maria Sayle-Terry I’ve lost to hawks (I’m in TN). Have only seen one eagle in the area. Our Roo keeps an eye out and they run to shelter when he sends out the alarm. I have no solution other than making sure they have something close to run under. The neighbors dog is a bigger threat. Gia Lamela We have a nesting pair of Bald Eagles on our property. We have free range chickens (including a rooster) as well. The Eagles are far more interested in our Koi pond than chickens. We have never lost a chicken to one of the Eagles but I think it may be because they have access to a river where they can get fish. If they were really hungry the chickens would probably be considered fair game. Rebecca Flagler-Hinds They don’t attack per se -they swoop and fly off with! We couldn’t figure out what was dwindling our free rangers until buddy Jimmy showed up and identified a group of six eagles that were in migration -since they left the area, we’ve lost no more chickens! Mary Lavaliere We do have eagles, but the chickens and ducks know it and keep an eye out. I think the ducks communicate the warning to the chickens and they run for cover. Haven’t lost any birds…a cat, but no birds. Kristi Ann Sherman Hi we live on a lake and have Silkie Bantams and a few laying hens. I have witnessed the Eagles attempting to kill ducks on the lake for hours. In order to rest they come to a big cottonwood on our property. At one time the Silkie Bantams were underneath the tree .. CROWING!! and the Eagle ignored them and still went for the ducks.. go figure… I am just glad they prefer duck than chicken! Rachel Peltier Had an Eagle kill a hen last week. Amazingly giant bird up close! Getting a Great Pyrenees to protect the flock. Kathy Ashby Kalin I have eagles all year around. They are huge birds. I did see one pick up a cat once therefore I keep my chickens in a run with a roof. You could use netting too, but make sure it is secure. There claws are sharp. Barbara-Jeanne Clark We keep our Border Collie out with them. He is always with the chickens and ducks when they come out of their yard. Yesterday he came in for about 15 minutes, I happened to look out the kitchen window and what’s sitting on the fence, you got it! A big ol bald eagle. Being a photographer I ran for the camera, while the husband ran for the door to shoosh him away. I’m bad…I was willing to sacrifice for a good shot. Well, opening the door caused him to take off anyway. The poor birds…we keep a covered dog kennel in their fenced yard as well as them having their big room in the garage. Most had gone into the room, but some were crunched up in the rear of the kennel. Poor things. My “little girl” was so shook up. But nobody got hurt. Alice Campbell I have lost two chickens to eagles. They have a hard time carrying them away but they severely injure the chicken. Bruce O’Donal We have eagles here in Maine too. And they do make a try for my birds. But so far the girls have managed to out run the eagles and get to cover. As a rule though, I have been lucky enough to happen to be in the yard to scare them off. The ribbon electric fence keeps the rest of the critters out, and the chickens safe. The Community also shared ways to protect the flock from avian predators: covering the run with netting or chicken wire; having ample natural places for free-ranging hens to take cover (trees, shrubs, coops, sheds); a guard dog or a protective rooster. A few facebook followers even noticed that I had missed an additional eagle in my photo! Shay Lewis There are 2 Eagles in that tree. Kristina Carroll There’s not one but TWO eagles looking around in that tree! Gloria Kariya Chickens can be eagle prey. They are huge birds, but I doubt these cows have any concern. To capture live prey, soars overhead to visually locate the item, then suddenly stoops and attempts to capture such items with 1 or both feet. Repeatedly stoops on waterfowl on the water but often with poor success. Most prey taken to a nearby perch site for consumption, although small items may be consumed on the wing. In areas with high concentrations of Bald Eagles, successful foragers are often chased. In such cases, successful foragers select perches away from the foraging area for less conspicuous consumption of prey. Items taken as carrion that are too large to carry off are eaten on site, such as salmon carcasses on gravel bars, duck and goose carcasses, deer, and occasionally domestic livestock (cows, sheep, pigs). Very few documented cases of predation on live livestock; Bald Eagles implicated in cases attributable to Golden Eagles (Phillips and Blom 1988, DellaSala et al. 1989, Marr et al. 1995). There would be more cause for concern with Golden Eagles. That said, it is certainly possible that a Bald Eagle would try to take a free range chicken, particularly if there are population pressures on the more reliable food sources. It is worth monitoring the situation, and please stay in touch! Western Wa here. 4 days ago, we saw a bald eagle in one of our pasture hallways (a 3 foot across space with a 3.5 foot tall fence on each side). He had just killed our grey runner duck, who was hiding in the tall grass near the fences. The past 3 days, he returns at the same time, today killing a chicken. We are starting to take it personally. 🙂 Wishing there was a way to deter these characters, because we are basically becoming a neighbourhood “fly-thru” for his dinner. North Central Florida here. I have lost 4 layer hens and a rooster to a Bald Eagle this winter. My pasture birds range on 12 acres of my farm. I use Great Pyrenees and Guinea Hens as a line of defense against predators. Bald eagles most definitely will kill chickens especially once they realize there is little fight for a big meal. Given their protected status there is little that can be done other than changing the time the birds are let out and put up in their coops. It’s very unfortunate. Beautiful birds of prey and an expensive problem too. Damn Eagles, I live in SE Minnesota an have eagles here year round. They have taken my chickens,ducks an cats. Had a Bald Eagle fly down into the barn yard when we were standing there an take a duck.couldn’t fly away very well so landed in the hay field to eat it.Another time I had young ducks in a pen,eagle flew down an tried to get them.Pen was inclosed in welded wire. Well, here’s another perspective, especially if you grow crops organically. The day before I read this post I read another one about eagles from the farm where we buy our milk, eggs, and chicken. It’s called “The Family Cow” ( read the article “The eagles have spoken” at http://www.yourfamilycow.com)and is in Pennsylvania. Apparently the eagles prefer their food organically grown! I’m in Maine and quite close to the Penobscot River. Last weekend I had my three girls out on a supervised field trip to the yard (I live in the woods!) We have had eagles circling HIGH above the property before. This day the four of us all ducked as a huge winged shadow passed over us! I looked up to see an eagle checking us out!!! Yes.. we ran to the the chicken coop and yes… we all went in under cover. 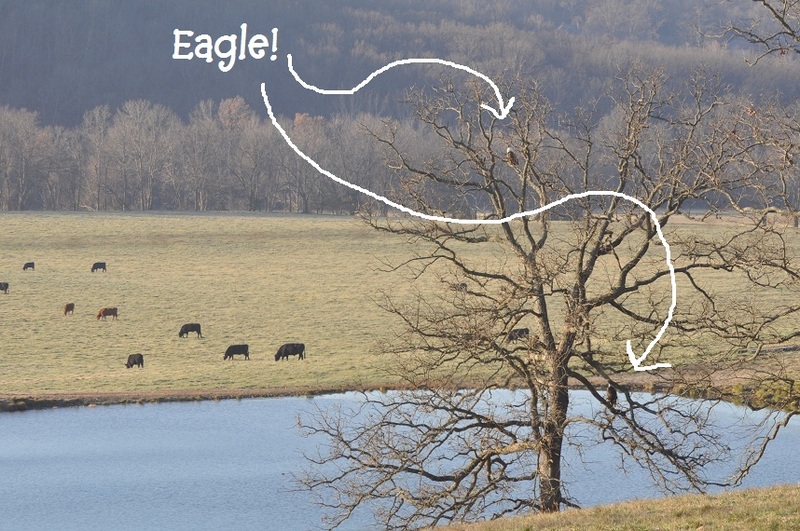 The eagle circled and circled before going away! Yikes! Yes, I lost a dark cornish hen this summer. I saw it land and take off. They have landed in the pasture before after some Rouen drake and some hen the got under a Alder tree and I came out yelling and the eagle took-off. The crows do a nice job of running them off. I seen it in the air a couple of times. I clean this State Biologists teeth and you can not do anything the are protected. I got Emden Geese did not do a thing to the eagle. Good luck if your poultry on pasture. Tractor them. Hi! I live in the Pacific NW and we have a LOT of eagles here..several live on the property, fish the creek (salmon, steelhead and trout), and also hunt my chickens,ducksand guinea hens. Last week a HUGE bald eagle carried off one of my guineas. My chickens rree range, but there’s a lot of apple trees that proect them. The guinea’s, however, sleep in tall fir trees. They were making their way (as they do every morning) to feed with the chickens when the eagle hit. I heard the hens squaking like crazy, with two of them flying into the chicken yard. I ran over just in time to see the eagle fly off with the guinea in his clutches. His massive wing span working hard to carry the load. It’s sad, but part of the risk of allowing my flocks to run free. I also have to watch for bobcats and coyotes….a coyote got another guinea just last night. That one is still a headshaker as guinea’s are the first to notice anything, and he caught her while eating with the geese!! What an awesome and well researched bit of information about eagles in regards to chicken keeping. 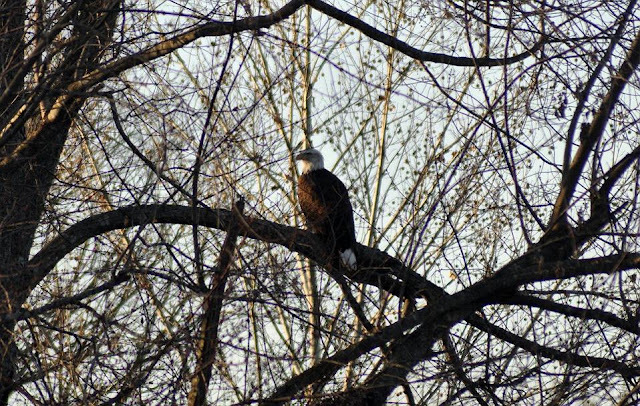 I live near a river and occasionally see eagles, although a roosting pair of osprey that live here quickly chase them away, and have wondered about the possible threat to my chickens. Now… if you could just do similar articles about other potential predators. What about turkey vultures and opossums for example? (Just kidding… sort of 😉 ). Vultures will not take live prey. Their feet are more like a turkey’s. Their talons are not sharp and they cannot grasp prey. They are however great for carcass removal. Opossums, on the other hand, will kill and eat chickens, but they are primarily nocturnal and not fast enough to catch a chicken on foot. ‘possums tend to take eggs, chicks, or adult birds will they sleep. I live in South-Central Iowa and we have LOTS of bald eagles around right now. I took my son to listen to a lecture about these wonderful birds when he was in middle-school and I think I learned more than he did! – They do have an enormous wingspan, huge talons and a vicious beak. HOWEVER, they tend to act more like vultures than predators. They will choose the easy food option over something they need to work for. I didn’t know this until after the lecture but, bald eagles don’t actually get those striking white feathers until they are about 3 years old. If you see a brown bird of about the same size and shape roosting with the eagles, it’s probably a juvenile bird! Great comment Wrenny! I’ve enjoyed watching the juvenile eagles around my property also. They’re a lot more active then the adults (reminds me of my teenage daughters)! Had a young bald eagle kill a guinea hen that was out with the chickens( we free range our birds). Beheaded the poor thing and then just stood there like what am I supposed to do now. My son who was 4 at the time when running out screaming at it and it flew up onto the kids swing-set/jungle gym. The bird had a 9 foot wingspan. When I called the state to inquire about Bald Eagles in area they told me no, none in area and then the very next week there is an article in the paper with pictures of a young bald eagle just a few miles from us, guess they where wrong. Thanks James! Sounds like a solution that’s working well… Thanks for sharing! 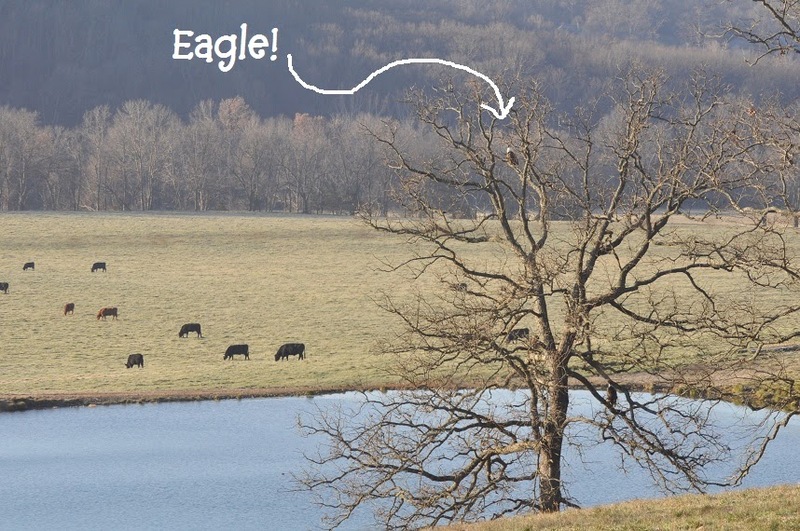 Bald eagles will not prey on the animals you listed (unless they are dead already or the birds are starving). To the untrained observer many other birds of prey resemble or are mistaken for bald eagles. The golden eagle (resembles an immature bald eagle), for example, will take anything it can subdue, including wolves and deer, this is most likely the eagle you saw. Bald eagles feed primarily on fish and carrion because their talons do not have the same dexterity as true eagles or hawks. Though Bald Eagles do feed extensively on fish and carrion when available, they’re also capable predators on birds and mammals. When easier food is in short supply, the wintering Bald Eagles here in southeastern Arizona will hunt Sandhill Cranes that weigh up to 14 pounds. The crane flocks always flush in response to adult Balds (even those that are not actively hunting), but they can also tell the difference between less experienced juvenile Balds and the similar-looking but more dangerous adult Golden Eagles. oops. i forgot to mention cats and small dogs. people have seen cats being carried away. one neighbor had her large German Shepherd attacked by an Eagle, who, in the end, could not lift the weight. hi all. here on the coast of Maine we have lots of Eagles and some to winter here. we’ve lost at least one chicken to an immature Eagle this winter. Eagles are definitely increasing thanks to the serious protection laws about them. but this causes new problems as they are taking the young of endangered sea birds because the fish population is down due to over fishing. “man” is not that good at managing nature! so here we are quite nervous about the safety of our chicken flock. an Eagle has no problem taking a chicken. I think if we (humans) didn’t interfere with the natural balance of nature, there wouldn’t be as much of a threat from an eagle attack. But as you mentioned–if the fish population is low, an eagle would have no problem making a meal out of a chicken. Thanks for your comment!